In the past year or two I’ve come to dread the “yet another social networking site.” But recently I’ve come across three really nifty web portals that all have an aspect of social networking, but offer more to the mix than just a place for people to buddy up. Personally I’m not a huge fan of typical social networks because I find them dull and pointless, and time that could better spent elsewhere; I don’t care how popular they are. But these three portals are special in that, while still social, they are each of them geared towards a specific purpose, and the social aspect is simply an enhancement on top of that core idea. What it all amounts to is a social network geared around the use of applications. 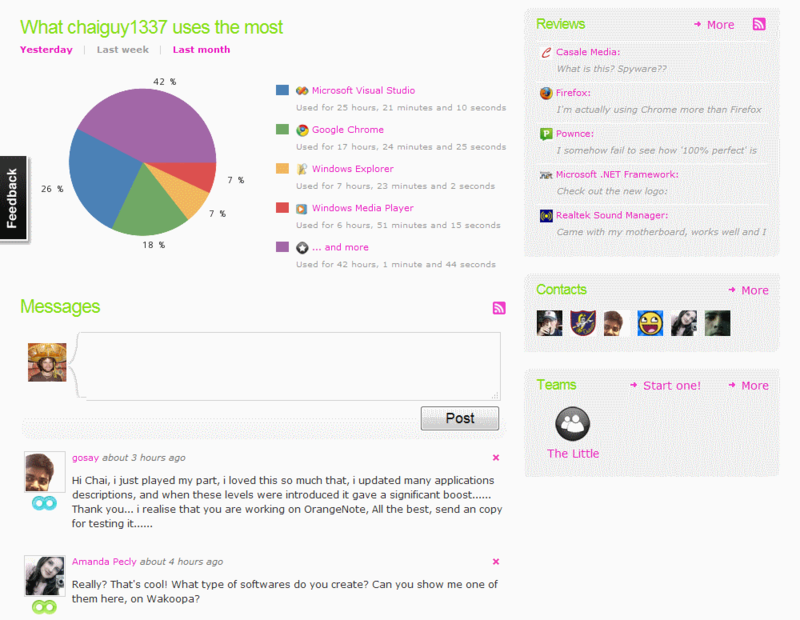 You can see exactly what applications you use on a regular basis, and find out what applications other people are using. Wakoopa is adding new features all the time, and they are great at accepting and replying to suggestions you have for making the site better. You can suggest new features at any time by clicking an ever-present “Feedback” tab on the site. You can see an example Wakoopa widget right here on pihole in the sidebar to the right. But the widget does not at all do the site justice, and you should really check it out for yourself. Just click the widget to be taken to my personal user page on Wakoopa (feel free to add me if you end up joining!). *This isn’t entirely true anymore, as Wakoopa now tracks web applications too, but is still oriented heavily towards desktop applications. The second site, UserVoice, is another that I’ve quickly grown attached to. It, too, is in its infancy, but already shows a great deal of promise. It’s basically a way to let users suggest new ideas and vote on them, so you can quickly find out what features your users really want, and which ones are only ho-hum. The publisher can add suggestions to see what end users think of them, or end users can add their own suggestions in a public setting that allows anybody to vote on anybody else’s idea. It could well be best way to come up with that next killer idea for your program, without even having to think it up yourself. The premise is based on a limited vote mechanism where each user has ten votes per application (or “forum” as they call it). However the cool thing that makes the whole idea work is that votes are reclaimable. For example, if you change your mind, or find another idea that’s more important to you, you can take off votes from other ideas and redistribute them to your liking. When an idea is “accepted” (the company agrees it’s a good idea and promises to implement it), your votes are returned to you and you can redistribute them to other ideas as you like. At first I thought GetSatisfaction was just the same thing as UserVoice, since it does have some overlap in that it allows end users to suggest new features and comment on each others’ ideas, but in fact there’s much more to it than that. Whereas a company’s UserVoice page is hosted and maintained by the company themself, GetSatisfaction is more a community of users than it is a company-hosted forum. In fact, users can even create a page for a company or product on GetSatisfaction without going through the company at all. GetSatisfaction allows companies to “claim” a page that has been created about them by the community, but even so that doesn’t give them control over it as is the case with UserVoice. Personally I really like this idea because it empowers the end user, and gives them a place where they can discuss a company or product without worrying about whether their comments will be “accepted”. As such, you can expect a (for the most part) honest commentary about a product or company, and GetSatisfaction company pages even provide a way for end users to rate a company based on how likely you are to recommend the company to a friend. As a developer and small company, I find something unique and valuable in each of them. I’ve already started a UserVoice page for OrangeNote, getting ready for the big release (which should hopefully be coming soon now), and am already excited about the ideas and feedback I’ll be receiving. But perhaps the best thing about all three of these sites is they are all completely free. I encourage you to explore them on your own and discover three good examples of how social networking done right can actually be a great thing. If you’ve discovered another social site that offers more to the mix than just your typical buddy list or race to get the most friends, be sure to tell me about it in the comments.